Time to get wild! Start the party! Bring them on board the XL because that’s what it was built for! To hold a big weight and have a good time while doing it! Come aboard, join the party and find out what the 2019 XL is all about. Moving through the water on the Model XL is much like drifting on a boat. It’s that stable. It’s easily the most stable SUP I’ve paddled, I put it down to a combination of shape and materials. A big part of the stability is due to the materials like the composite PVC and carbon rails, they ensure the rigidness of the board. While they make it super rigid, they also make the board a bit heavy. That’s the only downside, that with weight and being a big board, you’ll lose a bit of speed and turning capabilities. Though if you are looking for something to zip along in, I wouldn’t be looking at the Model XL and something more streamlined like the Expedition, Bay Sports Tour or the RPC Sport. The XL is the perfect family board or for those who prefer a comfortable, stable ride over speed and agility. Last year I piled 3 adults, a child, and a dog onto the board and paddled around. So it wasn’t really easy, but we didn’t sink! The kids absolutely love it and you can too because 1) You won’t fall off if they move around a little 2) They have handles to hang onto for safety. If you are paddling alone, I’d recommend you either be someone taller than average or experienced paddler with some technique and strength. 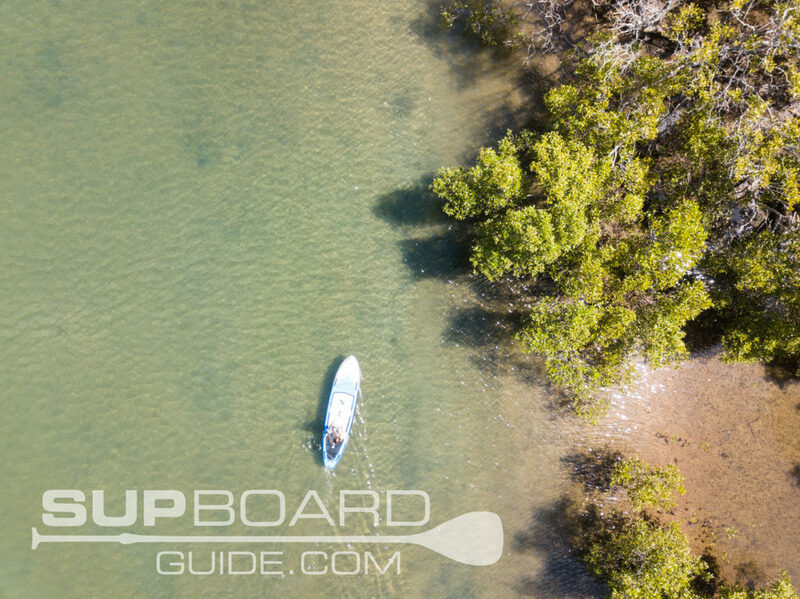 While if you are a complete beginner, you will be able to paddle the board definitely, it’s just that it’ll take some getting used to, to get it tracking and gliding well. If you want that perfect family and solo board, the Model X is a little more solo friendly. As far as location goes, it’s got a bit of rocker in the nose so it can handle some chop and winds. Being quite wide all the way through makes it a tricky board to turn quickly so I wouldn’t suggest waves or more turbulent waters. However, out on open waters, lakes, rivers, bays…etc. you’ll have a great time. 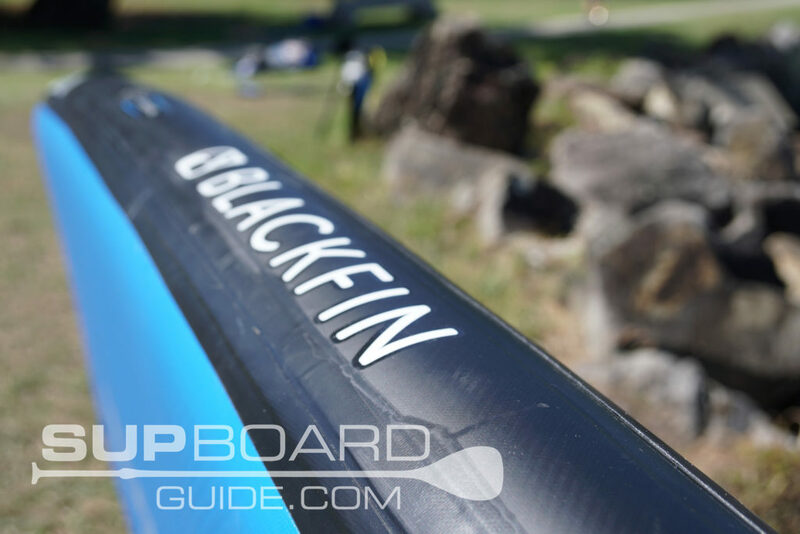 Inside your Blackfin XL, you’ll find the super stiff drop stitch core held together by a tough composite PVC. This PVC is a bit different from previous years. It’s stronger, so it’s allowed them to shed a layer of PVC and consequently 4lbs of weight. 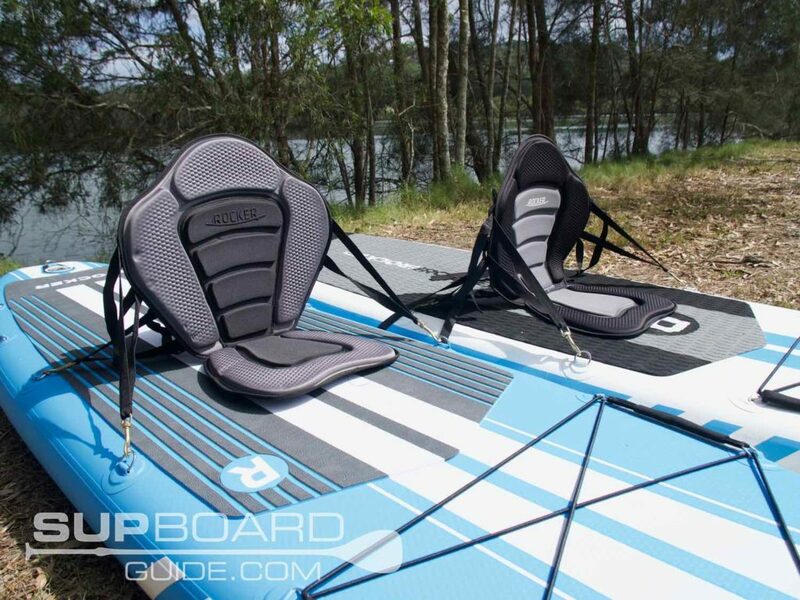 While the PVC layers and drop stitch core keep everything very rigid, iRocker decided they wanted to make one of the most stable SUP’s on the market as well as one that could take a large weight capacity. With that in mind, they added carbon rails to the Blackfins. These carbon rails can make the board a little tricky to roll up, but they bring about very stable and rigid results. While on top of all of this is your deck pad which is made from an EVA foam. 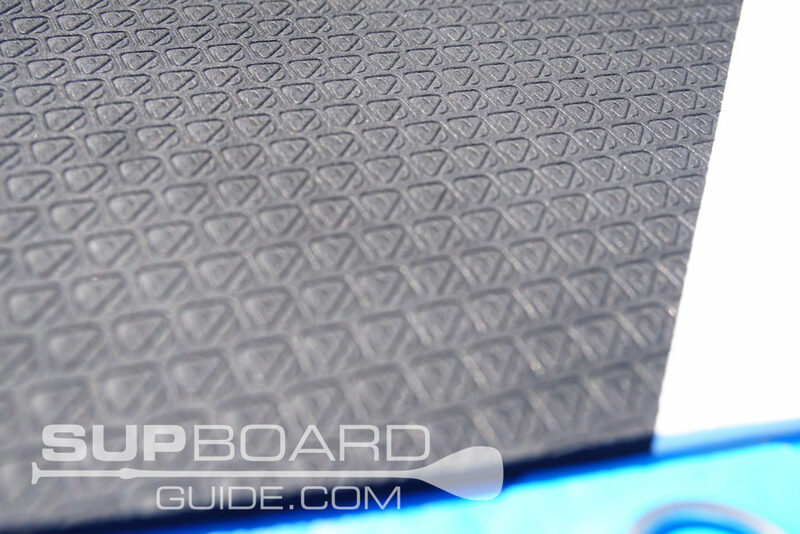 It’s imprinted with thousands of tiny little blackfin logos, to provide some extra grip. I’ve always found their deck pads to be supportive and comfortable as well as looking good! It’s all about stability and the party paddles on the Model XL. The board boasts a sturdy platform, so if your balance is a bit off, you may have just found your perfect match. 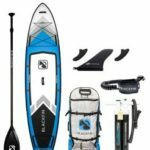 While this also means it’s an ideal board for taking the kids out with you or having a bit of gear. If you are thinking you want a board to take kids out on as well, then you can’t get much better than the Model XL or X. Boasting handles up the front and behind the paddler on the bungee straps means your little ones can hold on safely while you paddle around. Though these handles are also just great for moving the board around along with the nose and rear handles too. If you are also thinking about adventures, you’ll be stoked to know the XL is loaded with opportunities. 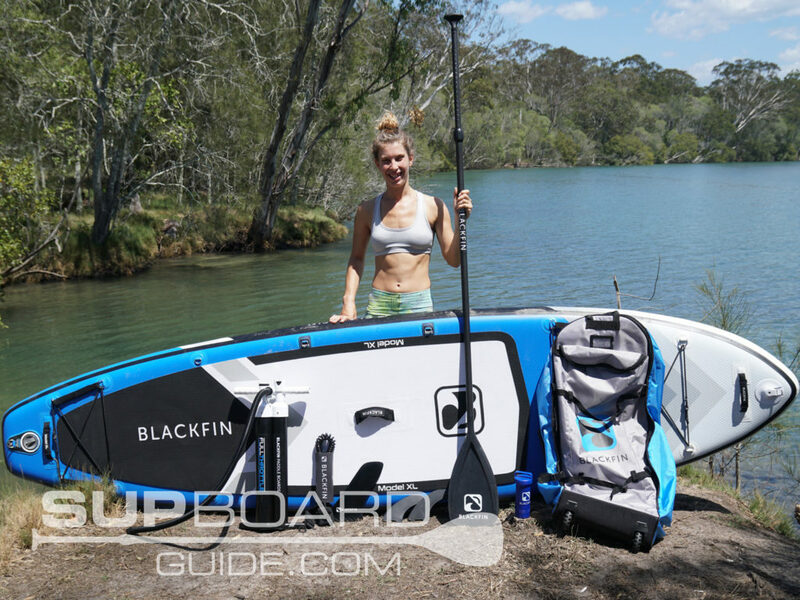 You can take advantage of the huge amount of storage, up the front and behind the paddler, using the bungee to secure your load or clipping bags onto the D-rings. While then you also have extra D-rings down the back of the board now which on the XL you could use to put another kayak seat on and go tandem kayaking. 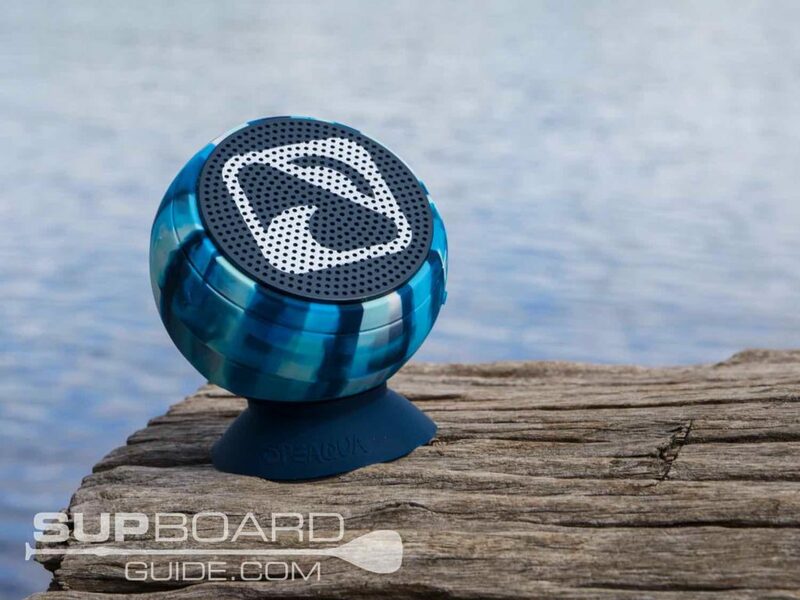 Up the front, there’s an action mount which is compatible with a range of fun things like a fishing rod holder, go pro and their new waterproof Bluetooth speaker (more details below). 2019 sees the side fins now removable as well as the center fin. This allows the board to be rolled up just that little bit easier. While it also allows you to utilize using just the center fin to amplify tracking. Just keep in mind the one center fin without side fins does mean you have to be more precise with your feet if doing back foot turns and wanting to turn swiftly. 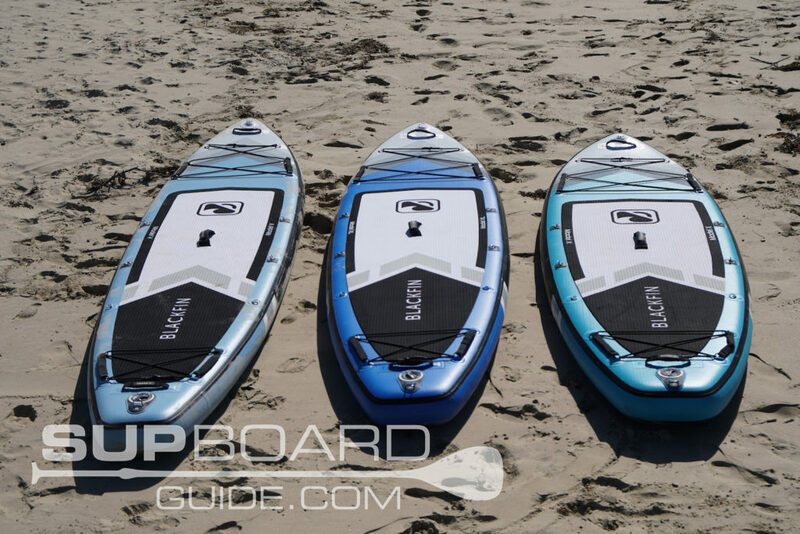 So whether you want to be able to turn easier or glide better, you can play with your fin options. 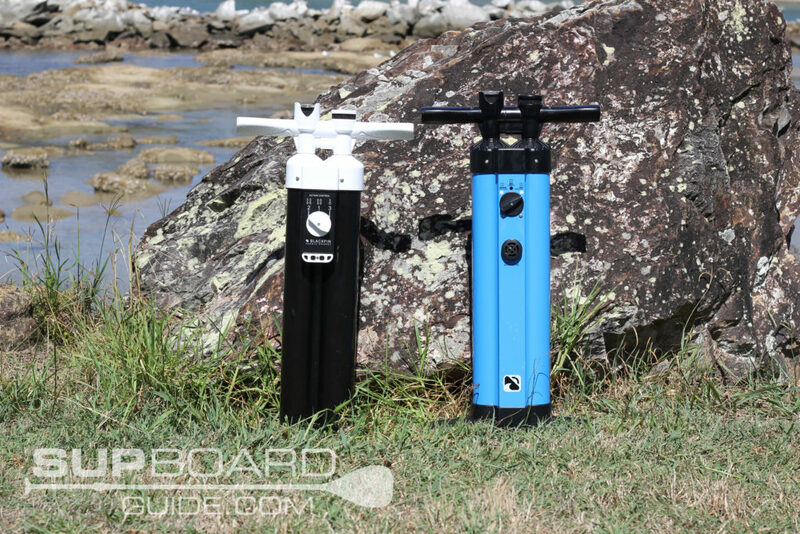 The US fin box also means you can even purchase your own center fins and play with the performance even more. You can swap out for lower profile fins or a dorsal shape to increase your turning powers. 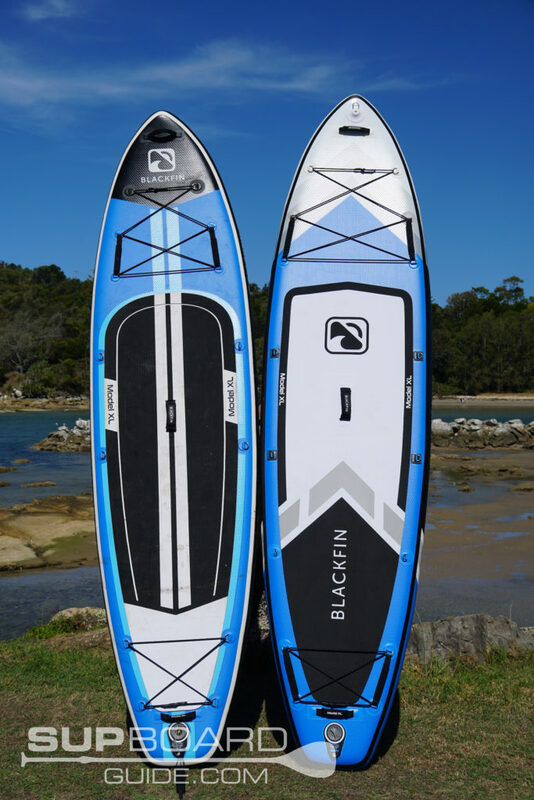 Though the fin that comes with the Blackfins is a really good fin, so you won’t be losing out if you don’t change it up. It’s a hatchet profile which is a specific style of a fin to help the board sticking to one line aka tracking. As this is quite a big board, it’s expected the inflate will take a little while, though not nearly as much as you would expect thanks to the full throttle pump included (more info below). In about 8 min I would say you can comfortably inflate the XL, maybe quicker if you don’t take moments of rest. While deflating is simple, pushing the pin in and twisting off to release air. The board rolls up that bit tighter with removable fins making it even easier to fit into the bag. The carbon rails make it a little stiffer to roll but nothing you won’t be able to handle. 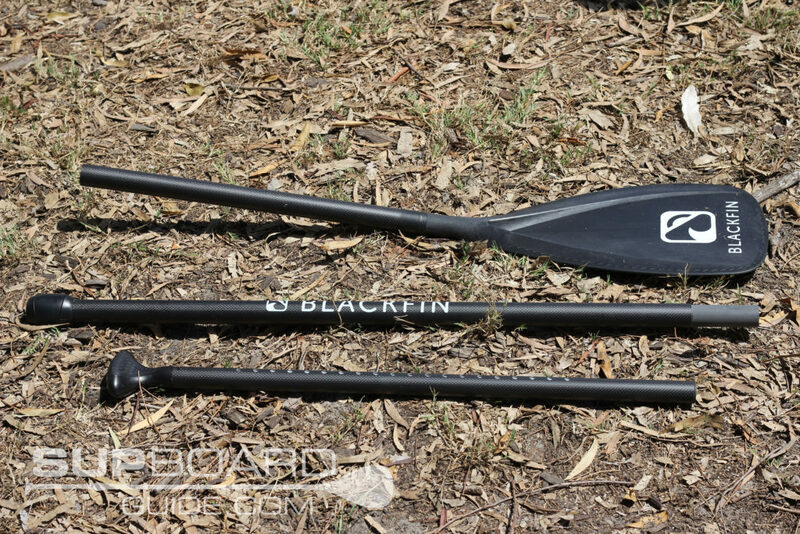 The blackfin carbon shaft paddle is a sturdy paddle that is well looked upon inclusion in your SUP package. The carbon shaft keeps the weight low at 32 oz, and the nylon blade is tough, so you can push off objects with no worry ( I know – I’ve tested it). The joints where it breaks down into 3 pieces are secure, producing no flex even with a strong stroke. The logo on my old 2018 has come off a fair bit over time, but other than that, it’s still in perfect condition. They’ve updated the look on the 2019 with a new logo, and I believe it will last longer. I appreciate the lengths of the paddle, as I have quite a few tall friends who like to come paddling and it can be hard to find a paddle the right size for them. The Blackfins though, they adjust from 72″ to 86″. 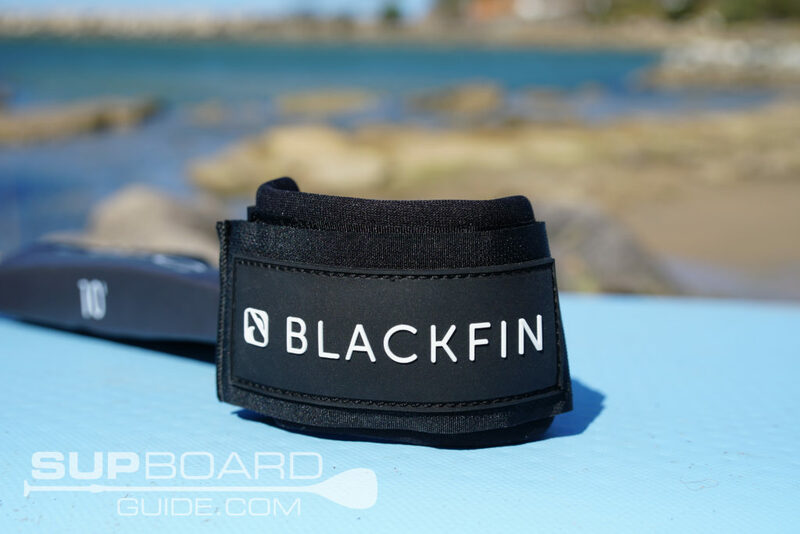 You’ll also come across your Blackfin leash when you unpack your new Blackfin. It’s coiled – keeping it out of the water therefore not getting caught on objects. While it’s also got a comfortable ankle strap and even a little stash spot for keys on the velcro. But how to move all these wonderful accessories around with your board?!?! A bag of course, and not just any bag…the Blackfin bag! One of the best in this price range. It’s got everything you need! Wheels for pulling behind you or comfortable and supportive straps for carrying. iRocker even has consciously put the wheels on the front so that the back straps can’t get caught in them. Inside your bag, you’ll notice some extra straps to secure your gear inside as well as an ample amount of space for everything. On the front, there’s a zipped pocket which the pump slides into perfectly and handles all over the outside for easy lifting/moving. As of 2019 the Blackfin bags are now color coded too! Getting the board inflated has never been quicker or less strenuous thanks to the full throttle pump. While it’s still a double chamber and triple action pump, it’s efficiency has increased as well as it’s overall weight decreased from the 2018 model. What a cool gadget! You can store 4GB of music inside the speaker, or connect via Bluetooth and take a waterproof phone bag out. Though most of us don’t want to do that so being able to store music or your favorite podcast in the speaker is perfect. It’s also completely waterproof, submerge it and give the fishes a party! It can attach straight to the action mount and also has a suction cap. Capture the moment 😉 This screws into the action mount on the front of your board. Feel free to invite me over for dinner once you’ve caught the first feed. It’s also attached at the action mount. Insulated cooler bag to keep snacks dry and fresh. 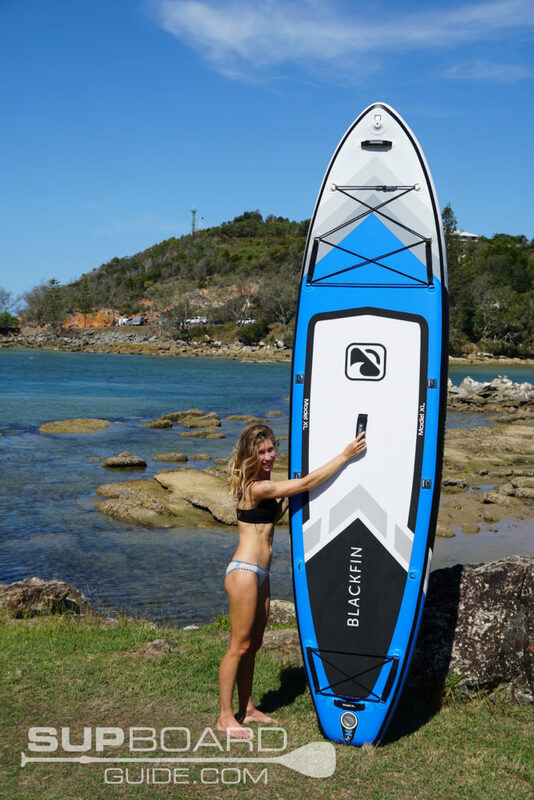 There’s a Blackfin option and an iRocker option, so you can match your board(s)? SUP turned Kayak! Awesome for creating a bit of versatility. You’ll receive a kayak seat that attaches to the boards D-rings and an extra blade to attach to the other end of your paddle. Make your life easier by attaching a carry strap! Simply clicks onto the D-rings in the middle of the board and you can adjust the strap size to make carrying your SUP a bit easier. You really can’t go wrong with the Blackfins. They are premium boards with fantastic accessories but for a bargain of a price. The Model XL, in particular, is a very unique board, which I can’t recommend to families wanting to go out together or others who feel they need the extra weight capacity &/or stability. iRocker supports its customers with a 2-year warranty and 30-day money back guarantee, but they are also just a genuinely awesome team! If you are having trouble making a decision feel free to reach out below, and we’ll get back to you ASAP!